Set each creature's power and health to 1. Power of the Almsivi is an epic Tribunal Temple action card. It is part of the Houses of Morrowind expansion. This card applies the Wrath of the Three card effect. 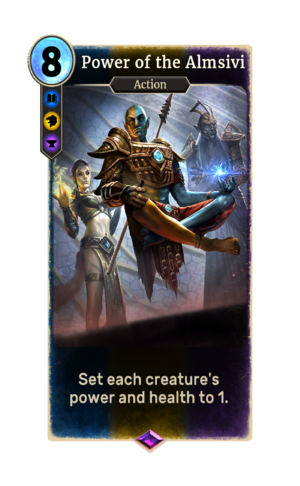 The card depicts and is named for the Tribunal (or Almsivi), Morrowind's deities from the First Era to the end of the Third Era. This page was last modified on 14 December 2018, at 01:11.